As most of you have heard by now, NCW's former director, the fabulous April More, has moved to New York City to begin her modeling career with the Ford Agency. The also-fabulous Amy Rivera, former head writer for Saturday Night Live, has been crowned our new director. Amy was recently nominated for a Pulitzer for her novel To Inconvenience A Mockingbird, and we're so fortunate to have lured her to NCW! The leadership changes don't end there! The Writing Bug editor, JC Linne, has recently sold the movie rights to her latest thriller, The F*cking Yoga, and will be moving to Hollywood with her husband, The Mustache, to begin re-writes. Reportedly, the studio has asked for a couple of car chases and a more whimsical finale. Not a problem for a pro like JC! In an exciting and unexpected move, the Northern Colorado Writers will merge with Northern Championship Wrestling. Both NCW organizations see this as a way to share resources and increase exposure. A team of designers has created a uniform that NCW members will wear to competitions, such as the Wrestling World Championships to be held in Kazakhstan in September where NCW hopes to qualify in the Under 2000 words class. 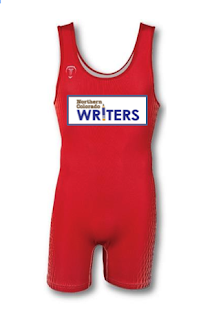 NCW members will be encouraged, but not required, to wear the official NCW singlet to the NCW Conference on May 3-4. Sizes come in YA, Memoir, and Horror. Order yours today on the NCW website. These classes will fill up fast so sign up early, especially if you have signed up to pitch to an agent compete. Love it! I'm glad I read this one first thing because now I'll be grinning all day. Thanks, Patricia! This was a fun one to write! You are marvelous, my dear and I needed the laughs! Thank you for never failing to deliver!